Anna was in a very cheery mood this morning and she surprised me with flowers, mimosa and tulips, that she bought from our friends downstairs in honor of International Women's day. She also took out from her enormous purse some jewlery from her private collection that she brought for T and me from Los Angeles. After a lunch of homemade burritos, we took her back to Zazzi's scarf store to meet the weaver who was hard at work at the loom. About three and a half seconds of just watching that lady slide her wrists back and forth with consistent pressure and perfect timing gave me second-hand carpal tunnel syndrome. I have no idea how she does it. Anna was unimpressed. She was also unimpressed with the beautiful church of San Frediano and with the antiteatro where she bought little tins of olive oil to bring back to her entourage back home. 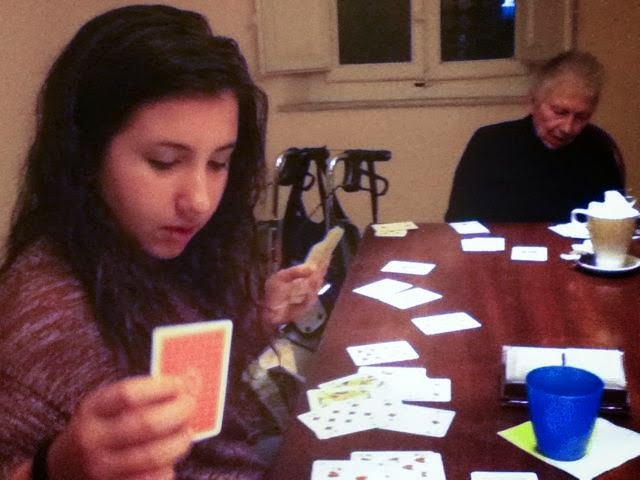 T and Anna playing gin rummy. 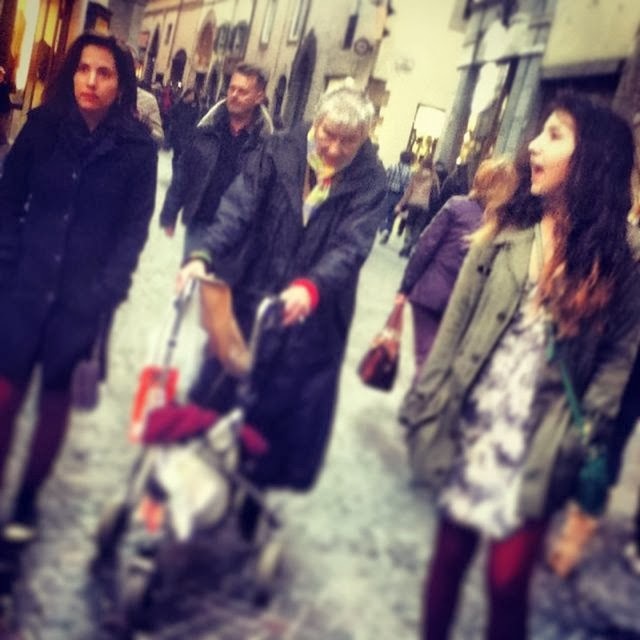 I wasn't there when they all went to get gelato because I have been dreaming about gelato for weeks. I was hoping Anna would love it, but T said she choked on it and had quite a bad coughing fit and that they had to get her some water immediately. Next Anna took T out to buy her a pair of Converse and a tee shirt. T had been forcing her toes to curl down to squoosh into her shoes for a while, but every time I offered to get her new ones, she always refuses. Not today, though, thank goodness. We did have to make two different passes at the clothing store because the first time there were people she actually knew in there. I get it. I was fourteen once, too. Whatever. Shopping the city, pian piano. Anna was pretty exhuasted at this point, which was totally understandable as two whole hours had passed without her refueling on caffeine ,so F took her out for a campari at the most popular bar in the city right by Chiesa San Michele. He nabbed a prime table out front. Anna took one sip and fell asleep at the table. F said that at least ten people he knows past by and waved at him as he smiled awkwardly and nodded, conjuring images of Little Miss Sunshine or Weekend at Bernie's. He then took her to the restaurant downstairs where they were assured that there was no garlic in the farinata soup before Anna fell asleep again and F ordered some more wine. 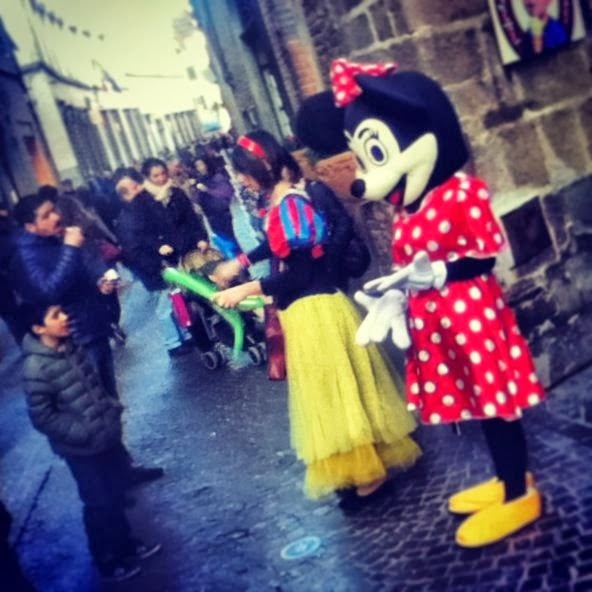 The great thing about Lucca is that Minnie Mouse actually hands out free wine. Meanwhile, T and I went to her friend Giorgia's house. Giorgia's mamma Cristina had sent me a text earlier saying that T should come prepared with a cake recipe because the girls were going to play master chef. I didn't really process this information so I was surprised to find Giorgia's dad and her brother along with somg guy friends all watching rugby on the comfy couch that I had been dreaming about all day. The women were in the kitchen, including Giorgia's grandma and auntie. They were itching to get started on the master chef competition. By this time my back and feet were throbbing from a day of walking really slowly over the cobblestones. At first I said I would just be judge Cracco, but then I asked Giorgia's grandma in Italian if I could help her and she replied, "What? Are you crazy? This is competition!" So I got cracking. Giorgia's auntie and I raided the fridge for our ingredients just like they do on the show. I asked immediately if I could phone a friend and Cristina laughed and said that was a different show, but yes. F gave me a few oven temperature and timing hints and I chose brussel sprouts, an onion, and red peppers, with lime, ginger, and soy sauce. It came out perfectly. T was more surprised than anyone. Her chocolate cup cake ala Martha Stewart apparently was stunning as well, but I don't know because I didn't get to eat it. I still have a few weeks left on my sugar ban. Giorgia also made an adorable cupcake with a vanilla and chocolate swirl that was impressive. Cristina made a sweet dumpling so I could only put one prong of my fork into it to taste it, but T ate at least three helpings of it. My favorite was auntie Paula's dish wish was a kind of bruschetta with boiled quail eggs, toasted cheese and tomatoes with a warm scrambled egg topping. Cristina's mamma who got a little buzzed on only half a glass of wine was the most inventive of the evening. She made a concoction based on raw carrots and lemon sauce that she called the Orange Garden which was weird. She also made Mars versus Venus which was a salad with a pile of pears on one side and celery on the other with three dipping sauces made of combinations of yogurt, lime, gorgonzola, and orange. Only one of those was edible, but she was very convinced in her efforts so T and I gave her rather high marks, although we knew she didn't have a chance. In the end, Giorgia's dad sampled everything and did the final vote tally on the voting cards that T had drawn up. It was really, really fun and we laughed a lot. 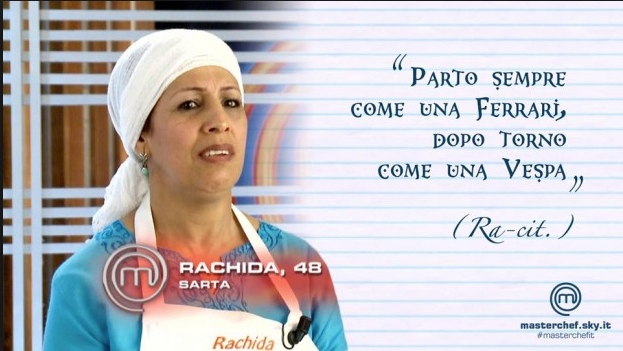 Cristina does a killer imitation of Rashida who was the Moroccan contestant on the Italian version of Master Chef and she even wore the hair wrap while her sister did the voice saying mi ha cascato la mano over and over again just like she did on the real show.